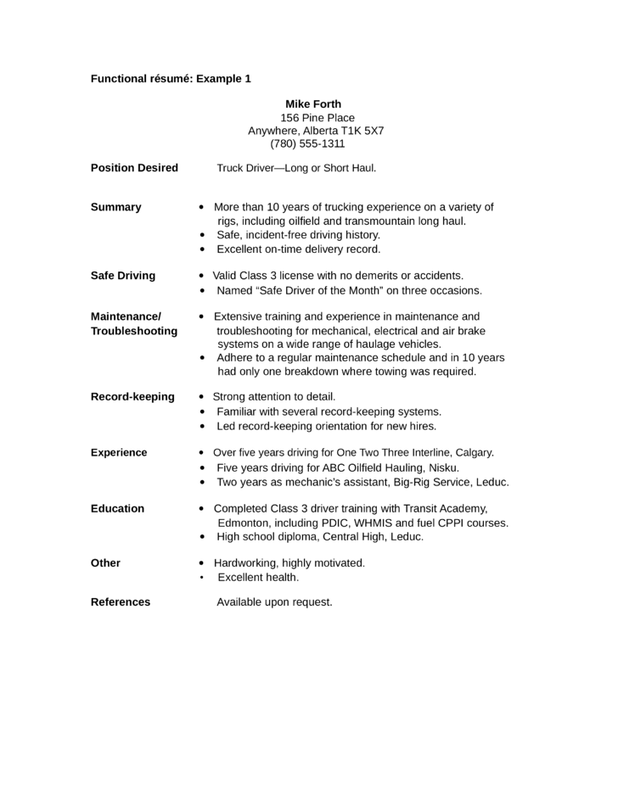 Position Desired Truck Driver—Long or Short Haul. rigs, including oilfield and transmountain long haul.  Safe, incident-free driving history.  Excellent on-time delivery record. Safe Driving Valid Class 3 license with no demerits or accidents.  Named “Safe Driver of the Month” on three occasions. systems on a wide range of haulage vehicles. had only one breakdown where towing was required. Record-keeping Strong attention to detail.  Familiar with several record-keeping systems.  Led record-keeping orientation for new hires. Experience  Over five years driving for One Two Three Interline, Calgary.  Five years driving for ABC Oilfield Hauling, Nisku.  Two years as mechanic’s assistant, Big-Rig Service, Leduc. Edmonton, including PDIC, WHMIS and fuel CPPI courses.  High school diploma, Central High, Leduc. Other  Hardworking, highly motivated.